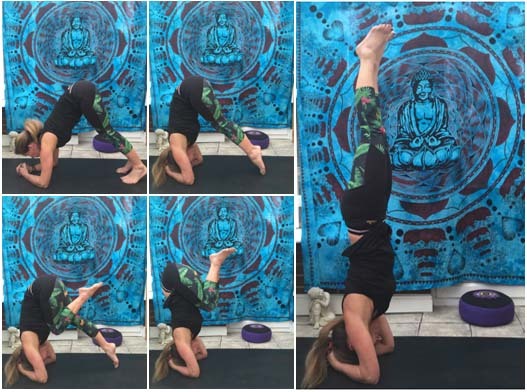 come with us on your yoga journey….. Stage 1 : Start from Downward facing dog and lower forearms to floor gently clasping hands together. This preparation pose is known as Dolphin pose. Any neck injuries stay in this pose and do not attempt stage 2 onwards. Stage 2: Lean forward and feel the weight on your forearms, outer edge of your hands and feel the strength in your shoulders. The head is resting on the crown but only about 10% of your weight should be supported by the head the rest is supported by the arms and shoulders. Stage 3: Tensing the core muscles lift one bent leg knee to chest on the exhale and lower on the inhale then repeat on the opposite side, do this several times. Stage 4: when you feel strong and secure in your foundation (shoulders and arms) and in your core, try lifting both legs to balance. For confidence you could use a wall or someone to spot you. Increases blood and oxygen to the brain, stimulates the pituitary and pineal glands, calms the brain and helps relieve stress and depression, increases core strength. Cautions: Neck injury, poorly controlled blood pressure, diabetes/glaucoma (due to pressure in the eye) headaches, back injury.